Happy FRIIIIIIDAYYYYYYYYY! Am I excited? Just a little! I finally decided to try a cloud mani. While I'm not 100% satisfied with the outcome, I think it was fairly good for my first try and I'll definitely want to give it another go! Next time I will give the bottom two colors more room to show and not do such a large section of the third! I did this using the polish brushes but I've also seen it done with a dotting tool as well. My nails were also so short here that I was pretty limited with what I could do. I hate it when my nails aren't at least to the tips of my fingers, but at least they grow quickly! amazing! 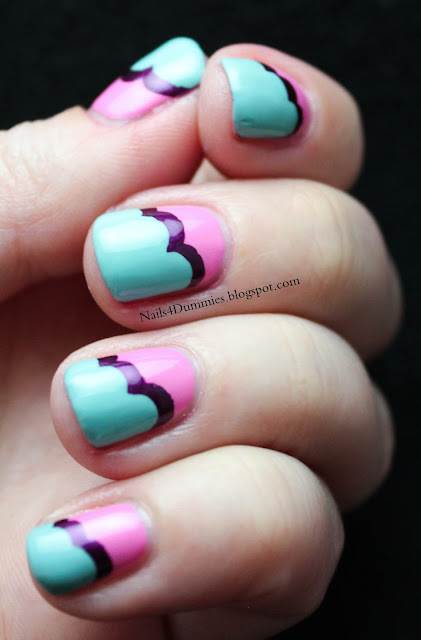 wouldn't have known it as your first cloud mani! And what a great color combo!